While that quote is true in the strictest sense, Emiko Queen is doing a damn good imitation. 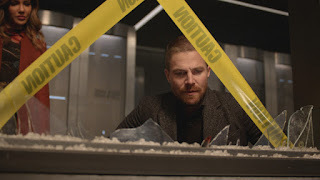 From the cold open it was obvious The Powers That Be were going for an OG Arrow aesthetic. From the voiceover, and (camera) shot selection to the little book of names, and a wounded Emiko going to Rene for help as Oliver went to Felicity. The similarities didn’t end there. She has just as many trust issues as Oliver and a stubbornness that up till now I had associated more with Moira’s side of the family. There is one profound difference between Emiko and her half-brother. Where Oliver sought to bring justice to the people his father had wronged, Emiko wants justice on behalf of the wrongs done to her. This is neither surprising nor unexpected. Oliver grew up with every advantage. His time in “hell” taught him humility and gave him an appreciation for those without silver spoons. Emiko grew up with little except the unconditional love of her mother. Her loss would drive anyone to desire vengeance. That is what we are talking about here. For all Emiko’s talk of justice, her war on crime in The Glades is not born out of benevolence. She has systematically eliminated everyone who had a hand in her mother’s death as she searches for the person who pulled the trigger. She can wrap it up in as much talk of the downtrodden as she likes. Revenge is not justice. I'm not judging. I'm just stating facts. That knowledge aside we are left with a host of unanswered questions. Chief among them why would a woman abandoned and forgotten by her wealthy father imitate her half-brother? Unlike Oliver, she’d always known about the existence of her half-sibling and the “other” Queen family. And considering Oliver’s checkered past, he seems an odd choice for emulation. And how? I can see her learning to defend herself out of the necessity of growing up in a rough neighborhood. But I can’t imagine archery being her weapon of choice. Oliver must come to grips with the fact that the latest person to don the Hood does so out of more than just admiration. Even after all the suspect deeds committed by Mama and Papa Queen, this is a new low. To know his father severed all ties to his own daughter makes Oliver question all of his father’s motives. Especially when he did so while knowingly raising another man’s daughter as his own. Although I doubt that realization has hit Oliver yet. Moira’s behavior is just as bad. It’s not surprising she resented Robert’s other family. But the idea she would go out of her way to ensure that Robert’s child was not only discarded like an old toy but deliberately kept poor is unbelievably spiteful. So why is most of Oliver’s anger directed at his father even after Felicity and by extension the writers repeatedly lay the blame for Emiko’s abandonment at both Robert and Moira’s feet? While Diggle’s motives may not be clear, we clarified a few unresolved issues. Deputy Director Bell is indeed subordinate to Lyla. However, her superiors at The Pentagon have appointed him as their watchdog which not only explains his apparent autonomy but also the deference that both husband and wife have been giving him. It also explained Ben Turner’s appearance in Slabside. He saves Lyla’s life at the risk of getting his head blown off and she repays him by scrubbing The Suicide Squad and sending him to a Supermax prison. No wonder Ben was pissed. That brings us to Rene, both present and future. In the present, Emiko’s pursuit of her mother’s killers dovetails with his desire to protect his neighborhood and Lord knows Rene can relate to her anger issues. Besides, partnering with her fills the void left by his former teammates and offers him the means to make a difference. However, the fact Emiko is neither part of the flash-forwards nor mentioned as part of Oliver’s Mark of Four pact leads to the suspicion that their partnership is short-lived. So it is not hard to draw a line from the current iteration of Rene adrift from his former teammates and frustrated by his inability to protect his home to the future Mayor bent on protecting The Glades at the expense of Star City at large. What is still in question is the identity of future Rene’s mystery friend and murderer of Felicity (IMDB has him listed as Kevin Dale)? Who does he represent and are they pulling Future Rene’s strings or do they just think they are? To be honest, this episode left me with mixed feelings. I appreciated the old-school feel. And the explanation of Emiko’s abandonment gave more depth to the Queen family dynamics years after Robert and Moira’s deaths, and Walter’s departure. Yet Oliver’s anger troubled me. Not only because of its one-sidedness but because his anger on his own behalf felt petty and his anger on Emiko’s behalf felt unearned. More important than that, the episode meant to introduce us to Emiko gave us more questions than answers and spent far more time on the people affected by her existence than on the woman herself. How is Emiko bankrolling this little enterprise? Bribing mobsters ain’t cheap. In that same vein, did Curtis borrow an A.R.G.U.S. van or does a tricked out van come with the secret lair and the Hood? We won’t discuss the whole chain of custody issue of giving crime scene evidence to the wife of an SCPD deputy. Can we say inadmissible in court, boys and girls? Emiko threatened to put an arrow through Rene. Oliver’s been there and done that. It was a nice touch having Jamey Sheridan read Robert Queen’s letter. It was bizarre that it was the only time my close captioning specified who was talking - wrongly stating it was Oliver. I could find no mention of Talis Global in the world of DC Comics. However, William Glenmorgan definitely exists. So does Santa Prisca. Future Rene doesn’t have his scar. Did The Glades Mayor get plastic surgery? The Archer program wiped out crime in The Glades. And somehow Zoe almost ruined everything when she got her hands on it. Color me curious. And I meant to ask this in Unmasked. When did the Queen Mansion get destroyed? Was Isabel Rochev so vindictive that she burned the place to the ground? Diaz: "When I agreed to this deal, no one said anything about sticking a bomb in the back of my head."